Global Navigation Systems, (a.k.a. 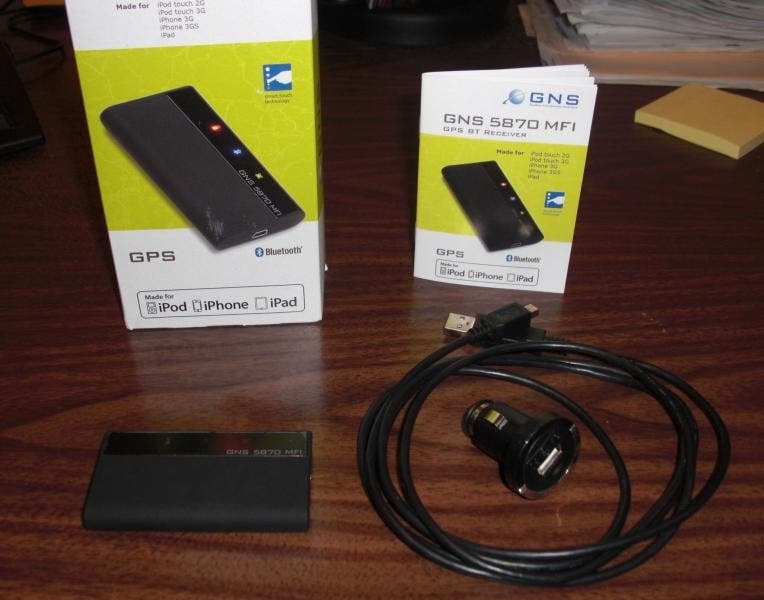 GNS) has created and sells a plug and play Bluetooth GPS receiver for IOS devices. 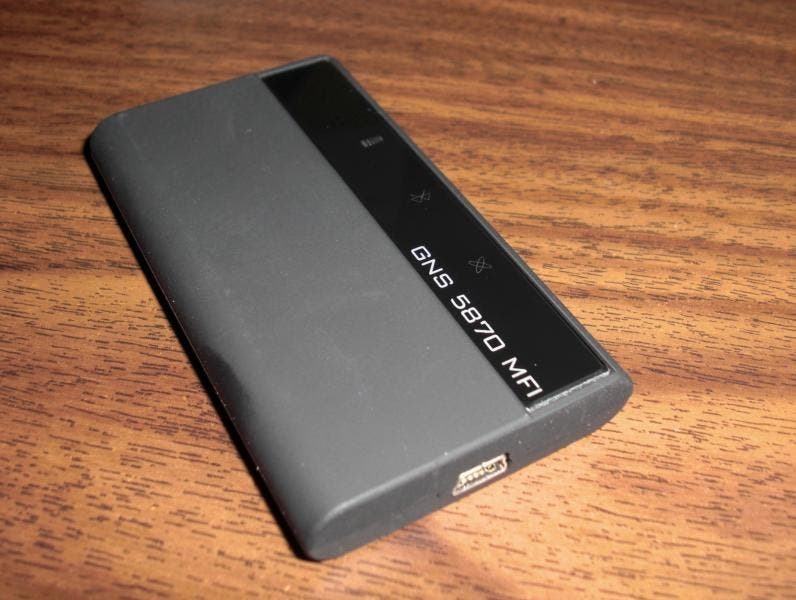 It’s called the GNS 5870 MFI. (MFI stands for Made for iPhone). I’m not a stranger to testing out and using GPS systems but this is the first one I have used for my Apple product, so I am excited to work with it. Even though I have some knowledge of GPS, I am by no means an expert in this area. There are two things I look for though. One, a quick satellite lock, and two, it just needs to work. There is no jail breaking required. I’m testing this out on my Wi-Fi only iPad. The Nav App I am using is Co-pilot. (I won an iPhone version of the app from a contest last summer. Since I don’t have an iPhone, I never got a chance to try it out.). I loaded this onto my iPad. In the package, you receive the Bluetooth GPSr*, charging cable, car charger, and instruction manual. The receiver itself is in a small footprint. It’s approximately 3 1/8 inches long, 1 ¾ wide and a tad less than ½ inch thick. It’s very light. The casing feels rubbery, like a smooth silicone texture. There are no operational switches, but there is a small reset pin hole on the side. 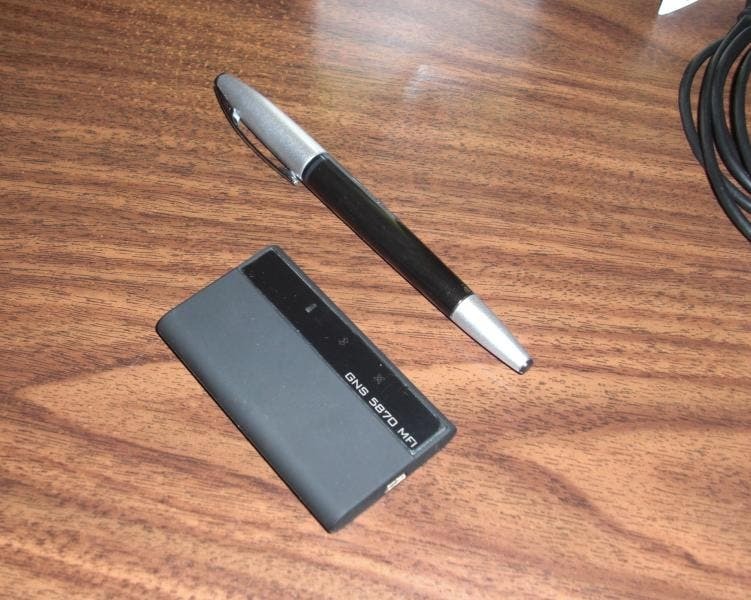 The mini USB connection is on the side of the GPSr also. To turn on and off, you just swipe the strip with your finger. Swipe once in one direction and you have activated the unit. Swipe it again in the reverse direction and you power it down. There are three lights on the unit. The instruction guide said to takes about 3.5 hours to charge completely. This seemed to be pretty accurate information. It was very easy to set up with my device. Swipe the receiver so it powers on. I activated the Bluetooth on my iPad. The receiver showed up on screen and I paired to it. I opened up Co-Pilot, set my route and backed my car out of the driveway. I had a satellite fix at the end of my driveway. This was consistent throughout the testing period. My driveway it pretty small, so this was quick. My Bluetooth pairing did not get interrupted at all. I only drove locally, as I did not have any longer road trips that I needed to make. I like that the receiver has its own built in power source. This also leaves my iPad 30 pin connector free for something else, or for its own car charger. Here are some miscellaneous notes I wanted to share. -When I was doing my research, I saw a mixed review from customers on Amazon. You will see this also when you click the link below. It seems that some of these issues were related to a firmware update that was needed. Units sold since Christmas have the latest update. -Some manufacturers have a related app that works with the GPSr. These apps also sometimes help out with updating the GPSr firmware. There is no app here. The firmware can be updated on the receivers though, and just need to be mailed to their service partners. -Most Apple certified apps should work with this. If you have a specific question on whether the GPSr is compatible with a certain App, email GNS. You can also email the App developer to see if third party Apple Certified GPSr’s are compatible with their app. 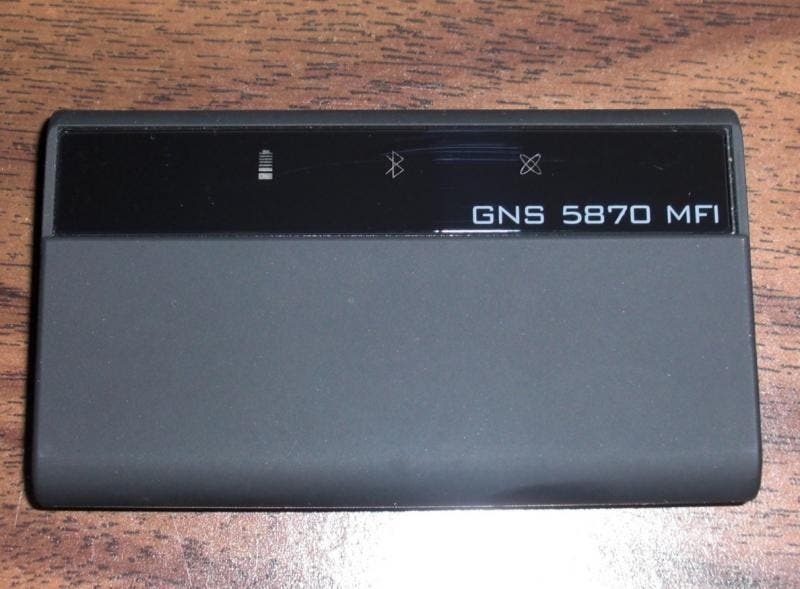 I am interested to see how other manufacturers can compare to this GPSr. Even though this was my first iOS device GPSr that I have used, I was very happy with the results for my needs. I experienced a quick signal fix and it just plain worked.